Braintree, Mass. – The final moments mirrored a Super Eight classic. Down 2-1 to BC High in the bottom half of the seventh, Braintree loaded the bases with two outs off Eagles’ ace Mike Vasil. Vasil, however, bore down and fired four straight fastballs, the last one generating a strikeout to give BC High a 2-1 win over the host Wamps on Saturday afternoon at Braintree High School. The loss is Braintree’s first of the season (2-1) while BC High improves to 3-1. Wamps’ starter John Tellier was nothing short of terrific through the first six innings allowing just one earned run on three hits while fanning in seven. With the score even at one in the top half of the seventh, BC High got to Tellier to take the lead. John MacDonald worked a walk and Will McCarthy reached on an error to put two on with one out. Moments later, Marty McCormack pushed the Eagles in front, 2-1, lofting an RBI double over the head of Wamps’ centerfield Jackson Duffy that scored pinch runner Seamus Donovan. Just one inning prior it looked like Vasil had given BC High the lead with his bat clobbering a fastball to left center field. Duffy, however, had other ideas reaching over the wall with the backhand to take a home run away from BC High’s three hitter. Braintree grabbed a 1-0 lead off the Eagles’ starter in MacDonald (4 IP, 1 ER, 2 H, 2 K) in the opening inning. Alex Kennedy dropped a two out single into left and Duffy followed with a groundball base hit of his own. 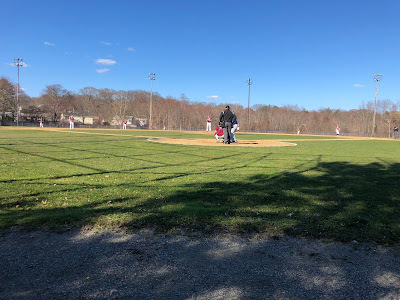 The Wamps’ were then the beneficiary of a some wildness from MacDonald as the right-hander walked back-to-back batters to force in a run and give Braintree a 1-0 lead. BC High tied the score in the top of the fifth. A walk, hit by pitch, and single from McCarthy loaded the bases with one out. McCormack then made a productive out knocking a sacrifice fly to center field to even the score at one. After MacDonald got through the first four, and with the score tied with one, Walsh turned the game over to his bullpen. Sean O’Connell fired home two scoreless innings keeping the Wamps’ at bay and setting the stage for Vasil to close it out in the seventh.